The 69 Eyes have been around for a quarter of a century but are as active in creating music as they have been all the way throughout these decades. 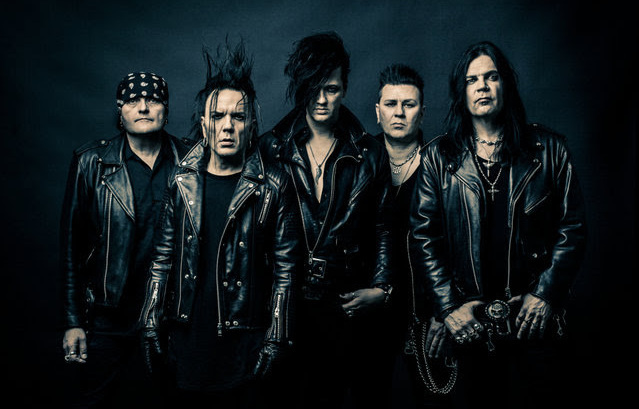 We sat down with the communicative frontman Jyrki 69 at Tallinn’s venue Cathouse to chat about the upcoming release of their very first Christmas song, as well as about their unforgettable recent tour of Russia, going as far as to the middle of Siberia. After today’s show at Cathouse, what’s on your agenda for the rest of this year? We play every weekend in November in Finland and they’ll play in December with HIM [at Helldone] – they have a farewell show. Finland, strangely enough, is a pretty big country, and we can play there every weekend all over the country. If we are not outside of our home country, we are playing inside the borders. Are you planning to release new music in late 2017, early 2018? We will release a new single on the 24th of November. That’s a Christmas song [‘Christmas in New York City’] and a video. The song was actually written for the last album, and it turned out to be a Christmas song. So it wasn’t originally a Christmas song? Well, it’s obvious when you hear it now but it took me a while to understand it’s a Christmas song. So we had to wait for Christmas to come. It’s just a song to thank our fans for a good year. We wanted to make it and I hope they discover it. But we are writing music all the time, and the next record should come out next year. You’ve just finished your Russian tour which covered not only European but also Siberian part of Russia. It was fantastic and I’m still thrilled by it. It happened two weeks ago but I wish we could return. I’m excited by everything all the time but I think other guys have also experienced something together that we haven’t felt for a long time. We had a new adventure to experience together and that was fantastic. How were the new cities you visited on this tour? We had really good time, met people who have been in touch with us for decades and made new friends. The part of the trip that we’ve just had will be strongly in our minds when we are recording our next album. I can tell you that already. We really want to go much further, especially to Vladivostok. As soon as the opportunity comes. I’m really excited by Russian culture, seeing all those places and learning more. I know that Russian fans love giving presents, from flowers to vodka to souvenirs. What were the most extraordinary gifts on this tour? It’s always something that people have made by themselves: drawings, paintings or handcrafts. They are really heartwarming. Also I got a really nice honey beer [medovuha]. I don’t normally drink beer but that’s something I might try again at some point. Have you noticed any changes in people’s music preferences over the years? For instance, today, I don’t know who comes to our show or what they want to hear from us. And recently, when we were in Poland, we played a song ‘Dance d’Amour’, which is a dark, romantic, yet poppy song in the end, and people formed a moshpit during that song! So people react differently to our and everybody’s music. We have so much diversity in our music over the years that it’s sometimes hard to know which kind of vibes people want to hear from us. You said you already started writing music for the next album. Do you feel like you’re in the mood to experiment with music styles or stick to your signature sound? I think it should be heavier, darker and lower. That’s what we feel right now. Where did you spend this past summer and what did you do? Basically, I was in the States and had a solo album out. It came out in June and I have an American band with me, all the guys are from LA. I’m going to tour in the States in March with my solo band. And whenever there’s time, we’re going to play in other countries as well. You normally just sing, don’t play musical instruments on stage. But can you play some instruments? Well, I can play the piano and as a kid I played the piano and the guitar. Those things happened because they were important for me to learn the notes and the principles of creating music. I’ve been thinking, maybe I should start to really rehearse playing the piano. I just haven’t had time. Also I used to draw comics as a teenager but then I hadn’t had time to do that for ages. As I know, Bazie is the one who writes the music for the band while you’re in charge of the lyrics. But are there any tunes in The 69 Eyes history which you came up with? A couple of our first singles I tried to sing straight, like, this should go like this. But it’s easier the way we are doing it right now. Bazie writes a lot of music, and I actually throw half of them into the trash can. Like, “Oh, that’s not good. Nothing comes to my mind. Next!” And I think we can afford it because he comes up with a lot of stuff, so I just listen to it a couple of times and if I immediately have the idea, that’s a good one. If I have to think more and more, it always turns out to be not that good. So, first impressions are the best? Yes! But, you know, I feel sorry for him because he has a lot of time. He also writes a lot of songs that I think are good but they’re also thrown into the trash can. Do you sometimes run to the guys to say: “Hey! I’ve got this tune in my head! Let’s write it down!”? I usually have the idea what the song should be about, maybe the lyrics for the chorus. And strangely, the music appears. So it’s some kind of magic? Yes. It’s a little bit like fishing. Always a catch. That’s how we’ve been doing it for a quarter of a century.